See also Blaine, Ohio for information on the oldest bridge in Ohio - the last-surviving three-arch stone bridge on the National Road. The National Road, today called U.S. Route 40, was the first highway built entirely with federal funds. The national road was authorized by Congress in 1806 during the Jefferson Administration. Construction began in Cumberland, Maryland in 1811. 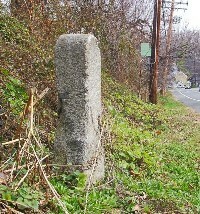 The route closely paralleled the military road opened by George Washington and General Braddock in 1754-55. The Conestoga wagon was the "tractor-trailer" of the 19th Century. Conestogas were designed to carry heavy freight both east and west over the Allegheny Mountains. These wagons were brightly painted with red running gears, Prussian blue bodies and white canvas coverings. A Conestoga wagon, pulled by a team of six draft horses, averaged 15 miles a day. By the early 1850's technology was changing the way people traveled. The steam locomotive was being perfected and soon railroads would cross the Allegheny Mountains. The people of Southwestern Pennsylvania fought strongly to keep the railroad out of the area, knowing the impact it would have on the National Road. In 1852, the Pennsylvania Railroad was completed to Pittsburgh and shortly after, the B & O Railroad reached Wheeling. This spelled doom for the National Road. As the traffic quickly declined, many taverns went out of business. An article in Harper's Magazine in November 1879 declared, "The national turnpike that led over the Alleghenies from the East to the West is a glory departed... Octogenarians who participated in the traffic will tell an enquirer that never before were there such landlords, such taverns, such dinners, such whiskey...or such an endless calvacades of coaches and wagons." A poet lamented "We hear no more the clanging hoof and the stagecoach rattling by, for the steam king rules the traveled world, and the Old Pike is left to die." Just as technology caused the National Road to decline, it also led to its revival with the invention of the automobile in the early 20th century. As "motor touring" became a popular pastime the need for improved roads began to grow. Many early wagon and coach roads such as the National Road were revived into smoothly paved automobile roads. The Federal Highway Act of 1921 established a program of federal aid to encourage the states to build "an adequate and connected system of highways, interstate in character." By the mid 1920's the grid system of numbering highways was in place, thus creating US Route 40 out of the ashes of the National Road. Due to the increased automobile traffic on US Route 40 a whole new network of businesses grew to aid the 20th century traveler. The stage taverns and wagon stands were replaced by hotels, motels, restaurants and diners. The service station replaced the livery stables and blacksmith shops. Some of the National Road era buildings regained new life as restaurants, tourist homes, antique shops and museums. Route 40 served as a major east-west artery until the Federal-Aid Highway Act of 1956 created the interstate system as we know it today. With the opening of the interstates much traffic was diverted away. The "Old Pike" has certainly not been "left to die" as the poet of the 19th century lamented. Technology of the 20th century combined with increased interest in historic preservation has led to the creation of heritage corridors. The National Road Corridor has been designated a state heritage park to preserve and showcase Pennsylvania's rich industrial heritage. The National Road Heritage Corridor is a partnership among government, business, organizations and individuals all working together to enhance the region's economy through tourism. The National Road story will be told at the new Fort Necessity/National Road Interpretive and Education Center opening in 2004. It is a story of American growth, development and migration; the story of the past, present, and future of American travel. The story of the National Road also is told in the National Road - Zane Grey Museum (see below) which is less than an hour away from Stratton House Inn. Note: This history is included here courtesy of the National Park Service. The National Road / Zane Grey Museum has three major exhibit areas. First is the National Road, early America's busiest land artery to the West. The National Road stretched from Cumberland, MD. to Vandalia, IL. Begun in 1806, the "Main Street of America" was the only significant land link between east coast and western frontier in the early 19th century. A 136 foot diorama of the National Road plus many objects illustrate this theme. Second is Zane Grey, the "Father of the Adult Western." The Zanesville author wrote more than 80 books. His study is recreated plus many manuscripts and other memorabilia are displayed.